The sphere is measured in Dioptre’s, your prescription may have the word Plano or Pl or an infinity sign, this means that you are neither long nor short sighted but zero power for the Sphere, however you may have astigmatism – a CYL and AXIS on your prescription. Most values range from 0.00 to +/- 20.00 and go up in steps of 0.25. Prism powers will always be accompanied with a direction which is usually seen as a base diresction such as IN, OUT, UP and DOWN; for example; Prism 2.00 Base IN. Some people may have prism in two directions for one eye, for example; Prism 2.00 Base IN & 1.00 Base UP. We can offer up to 3.00 Dioptre's of prism online however if yours exceed this or if you have more than one direction for each eye please contact us to confirm suitablility and availability. The Pupillary distance is an essential measurement. It is the distance from the centre of one pupil to the centre of the other pupil measured in mm (ranges from 50 to 70mm). Each spectacle lens will have an ‘optical centre’, this is a point on the lens where it performs the best and has the least distortion. The optical centre of each lens should be placed directly in front of the centre of each of your pupils. That way, your eyes are looking through the best point on each lens, some prescriptions may have the PD/Pupillary Distance listed for each eye respectively, for example RE: 32 LE: 32, you would enter 64mm from our list. If the PD/Pupillary Distance for the glasses is not set correctly then your eyes may have to strain to look through them, this can lead to headaches, eyestrain, visual distortion and in severe cases, double vision. The PD/Pupillary Distance is generally measured during a sight test, but is not routinely written on a prescription, you can ask for this from your Opticians, or ask them to add it to your prescription when you are tested. If you experience difficulty in obtaining this measurement we can record it, if necessary, from an existing pair of your glasses, to find out more click here. Dist, refers to distance, this is the prescription required to correct distance vision. This correction is often used for driving, television and general wear (walking around). These glasses are often worn full time. Inter, refers to intermediate, this is the prescription required to correct intermediate vision, and may appear in full, or as an additional power (ADD) to the distance. If you require spectacles for intermediate use include the INTER ADD in the ADD box when ordering and also advise us in the additional info box that you require these for intermediate use. This correction is often used for computer (VDU) operation. Near is the prescription to correct near vision and may appear in full, or as an additional power (ADD) to the distance. This correction is often used for reading, sewing and any detailed close work. Your prescription gives us, your Opticians or Doctors recommendation for clear and comfortable vision. 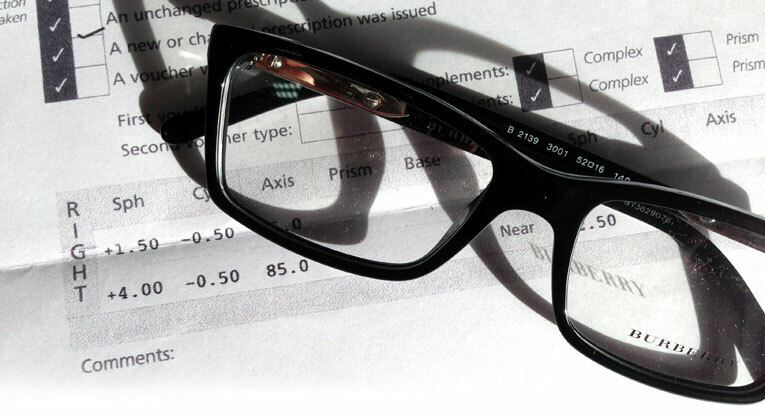 All Opticians and Doctors worldwide work to the same procedures when writing a prescription, which can be printed or written in a similar fashion to this sample prescription. You will notice there is no CYL or AXIS for the left eye, this means there is no astigmatism present. Your optician may or may not write DS (Dioptres Sphere) in the CYL box. DS (Dioptres Sphere) means you only have a Sphere power. DS simply means no power is present in the CYL box so leave this as NONE or DS. If your prescription only shows the SPH box with a value, leave the CYL and AXIS blank. The BVD stands for Back Vertex Distance, this is a measurement that is included on any prescription where the sphere or cylinder powers are higher than + or - 5.00D and to a lesser extent some prescriptions where it is less than this power. This measurement is important as it explains at what distance your lenses should sit from your eyes. Usually your lenses will be positioned around 10-12mm from your eyes, however this will vary from person to person. If your prescription includes a BVD, it is important that the lenses sit at the correct distance to ensure comfortable vision. If in doubt just enter your prescription as you see it, if you’re not sure what type of lenses are suitable, hover your mouse over the question mark next to the lens type to reveal more detailed information about the product. We always recommend attaching a copy of your prescription to the order, or fax this through or email it separately, we will double check the prescription this end to ensure the correct lenses are produced.